Two of the most successful examples of cyber-sabotage and cyber-espionage were introduced through anonymous flash drives simply scattered in parking lots. HUNTSVILLE, AL, March 20, 2019 /24-7PressRelease/ -- To call the pursuit of data security solutions today a search would be an understatement. It is more like a stampede. Forbes estimates that $170 billion this year will go to various data security solutions, and the operative word here is "various." The search proceeds in so many directions at the same time that it is more like an explosion. The utter vulnerability of these visible points of access is not just theoretical. Far from it. Two of the most successful examples of cyber-sabotage and cyber-espionage were introduced through anonymous flash drives simply scattered in parking lots. Even the most trusted, best-trained associates don't hesitate to use a "found thumb drive," as research studies further prove. Protection for our ports and connectors, while often overlooked, are not optional. They constitute a vital sector of your overall cybersecurity perimeter today. To enhance physical security, The Connectivity Center offers an extensive array of devices for securing those ports and connectors, and thus completing an organization's cyber-defense perimeter. Among those solutions is its Smart Keeper collection of computer and laptop security devices. 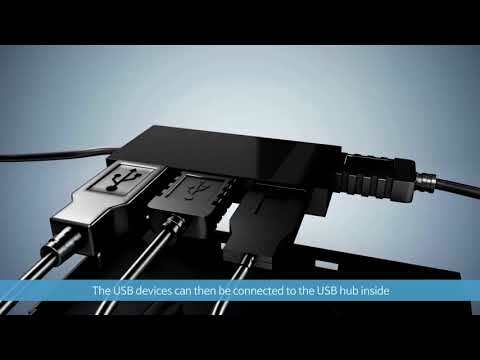 In addition to securing USB ports and network connections, its Link Lock connectors and the Link Lock Hub also lock devices so that they cannot be removed without authorized access.